The array of all certified Kosher goodies in this Gourmet Kosher Hanukkah Sweets Gift Basket is de..
Time to get the party started with a basket full of gourmet goodies! Capalbo’s luscious ..
12-piece fresh fruit assortment Clearbrook Farms peach fruit butter Partners sweet onion crack.. Send a delicious Chilean Don Alfonso Cabernet Sauvignon red wine basket, with best wishes and much a..
Don Alfonso Merlot red wine, four pieces of farm fresh fruit and a sea of delicious kosher gourmet g..
Kosher gourmet goodies and 6 pieces of farm fresh fruit - heavenly! 6 pieces of farm fresh fr..
Have some great times - anytime - with a gourmet basket filled with the great stuff! 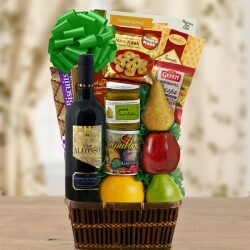 Ferrero R..
Show your sympathy at the loss, with a kosher shiva basket, including a 6-piece fresh fruit assortme.. Delight in this glorious gift basket filled with kosher gourmet offerings and a 7-piece delicious fr..